Over the past few months I’ve been trying to find a better balance of work and family and time for myself. I’ve been exercising more and have managed to drop nearly 35 pounds. I’ve signed my daughters up for activities they like and that fit into our busy lives. But gymnastics and swimming and soccer and all the other events that fill the lives of young children take more time than you’d expect. And this year I’m teaching a course I haven’t thought much about in over ten years, so prep for that is certainly much more extensive than for the classes that I’ve been teaching regularly all along. Also over the past few months, education has very much been in the news. Mostly news that is critical of public education and all of the bad teachers that seem to populate our schools. It’s demoralizing (at best) to live in an atmosphere of such negativity. And frustrating to know that all of the good work that so many of my colleagues do every day with kids is never going to be recognized when it is much easier to point to standardized test scores or listen to what Oprah or Bill Gates have to say about education. For the past two years I’ve found that blogging was a way for me to clarify my thoughts. I like to share what I do and what I’ve learned. But I also have found myself criticized for being open with my opinions and thoughts on education. Which is to say, I’ve found that taking the time to blog has been a distraction from the immediate business of life. Taking the time to thoughtfully reflect on my practice takes away time from planning my lessons or being with my family. Taking the time to engage with other thoughtful educators means that I have to turn my attention away from other pressing demands. I want to renew my commitment to blogging and sharing my thoughts, concerns, and ideas about education. I want to. But right now, I have to submit my grades. And plan for the week. And develop goals for the next year. And complete paperwork to seek re-certification. And grade projects. And plan for an observation. So when Oprah and Bill Gates want to take the time to see what it really means to be an educator in a public school today, I’d be more than happy to have them follow me some day. But until then, tempus fugit. And I need to get back to the everyday work of being a teacher. This post is also published at The Professional Learner and has been co-written by Michael Springer and I. Here are two professional development possibilities that are in the works. Which policy appeals to you the most? If you could write the PD policy for your district, what would you look for? All teachers will attain certain goals each year of their employment. They will attend prescribed workshops (e.g. blogging, podcasting) with specific targets to be met at the end of every two years. By the end of 6 years in the district, all teachers will be expected to have met all of the PD goals by attending the predetermined workshops. Teachers will be evaluated on their successful completion of the workshops and having demonstrated mastery of the material covered in each workshop. Continued employment is contingent on regularly meeting the goals detailed in the district plan. As a benefit of employment, all employees will be given the opportunity to further their professional knowledge through participation in workshops designed to increase knowledge and understanding of technologies. These life skills workshops will be offered regularly with a variety of topics to be presented during each workshop period. Workshops will include podcasting, blogging, building a PLN, etc. During each session, educators will have the opportunity to choose which workshop best meets his/her current needs. Each two years the educator will list the workshops attended and reflect on how those tools/skills have improved his teaching/learning. At the end of 6 years all teachers will have had the opportunity to attend all of the district’s workshops. Which plan would you vote for? Things to add or subtract? Pros/cons? Ellen Commito and Mia Gaska have presented an interactive workshop on using iPods in the classroom as part of the Blue Ribbon Institute. They shared samples of activities they’ve done with their students and podcasts (both student created and teacher made) that they have used to support teaching/learning their their elementary level classrooms. Here are my notes from Google Docs with links to some resources that might be helpful. This morning I attended an excellent workshop presented by Steve Olivo (@solivo11) and Kathy Favazza (@kathyfavazza) as part of the Blue Ribbon Institute for Academic Excellence. Here are the notes that I took in Google Docs. This includes links to the sites that were mentioned, including Jing, The Edublogger, Blogger, and A Difference (Darren Kuropatwa’s blog). In the past I have mentioned that I use VoiceThread with my classes for digital storytelling. VoiceThread is a web-based service that allows you to upload images (a PowerPoint, photos, documents, or even video) to create a presentation. What makes VoiceThread different is that you can then comment on each slide, creating a narration or explanation that is either typed or recorded. Then, depending on the publishing options that you choose, you can share your VoiceThread either with only a few individuals or with the entire world. Anyone you share it with and who has a VoiceThread account can then add their own comments to your presentation. One of the first projects I used VoiceThread for was a storytelling project with my Latin Studies classes. These students are mostly juniors and seniors in high school who have repeatedly failed in their studies of other foreign languages. The goal of the project was to review a number of grammar concepts, particularly noun cases. Students wrote their own stories and demonstrated their understanding of the grammar through the Latin writing. They then chose or created images that best told their story. Finally, they recorded themselves reading their story using their best Latin pronunciation. Students viewed each others’ stories and left comments for each other. One example of this story is “The bear who cried ‘boy’” created by two boys in the class. Their story was created in PowerPoint and then uploaded to VoiceThread. In “Sabina’s Bad Day” the student who created it found images mostly from stock photo sources. She then inserted the text using SMART Notebook to create the basic slide show. In our Latin 1 classes, we start the year by asking our students to find examples of Latin mottos or phrases that are still in use today. This year we used VoiceThread to again add the oral element to the presentation. Most of the presentations were created using either PowerPoint or SMART Notebook. Then the images were uploaded to VoiceThread and students recorded their comments there. Students selected mottos that all followed a certain theme, then chose images that best illustrated the motto. Some examples of this project are: Latin Love Mottos, and Philosophical Latin Mottos. As these projects suggest, I teach Latin at a public high school just north of Boston. I expect my students to create their own presentations (for the most part) and then we use our language lab to record the comments. 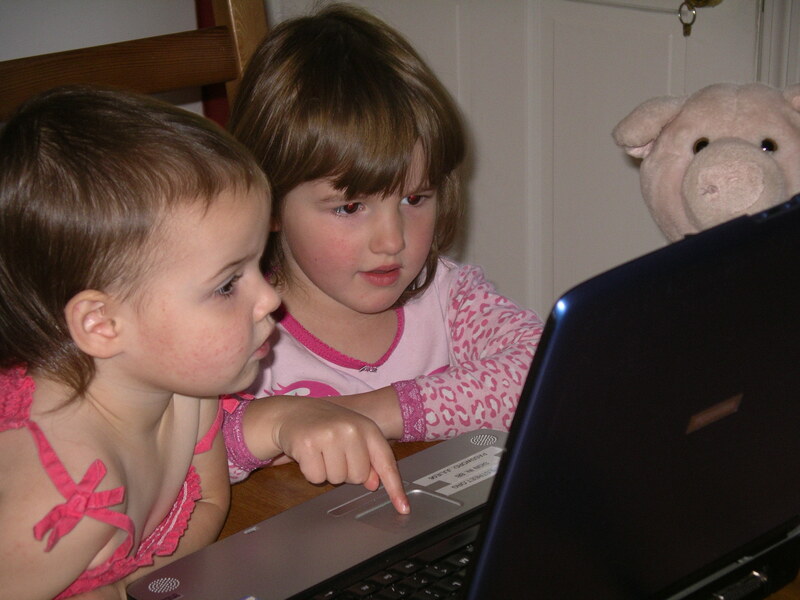 Occasionally I’ll use VoiceThread to create projects with my daughters (ages 3 and 5). This fall, on a particularly exhausting and rainy Friday afternoon, my girls were driving me crazy to play on my computer. Together we created Three Lonely Dinosaurs using SMART Notebook and VoiceThread. The girls chose all the images from the Gallery in Notebook and then Bridget recorded herself reading the story. This is when she first began to read, so we shared it with family and friends who might not otherwise get to hear her. This year my older daughter is in kindergarten. She does well with letter recognition and writing, she is even reading short chapter books. Each week her class studies one or two letters and their homework is to find pictures or draw things that begin with the assigned letter. Bridget enjoyed it at first, but soon became bored looking for pictures in magazines. When I spoke with her teacher, she thought a VoiceThread sounded like a good option. Each week my daughter and I brainstorm some words with the key letter. I then help her search for appropriate images on the internet. We create the “book” using SMART Notebook, inserting the images and choosing the colors for the text and background. Using my laptop and a headset Bridget records the words and the letter of the week. What I’ve really enjoyed watching is her own developing sense of what will make a good presentation. At first, she didn’t care much about the color of the background. But when she saw that some pictures look good with light backgrounds and others look better with a matching background she started to get choosy about what she wants each slide to look like. This week she did all of her own recording and was really choosy about how the final recording should sound. Some slides required five or six takes for her to say it just that way she wanted it. Sometimes she spoke too slow or she stumbled over a word; it was easy to delete the bad recording and do it over. Our first effort was Pajama Party, with more recent projects being Bridget’s R Book and Bridget’s Y Book. Although I write mostly to share things that I think can apply to educators, I can’t leave out one last VoiceThread we enjoyed making. When Bridget was recording her stories, my younger daughter was jealous of the fun she was having. Together Julie and I created Hiking at Lake Winni using pictures of a recent trip we had taken up to Lake Winnipesaukee. This was a wonderful way to share Julie’s personality with family that lives around the world. VoiceThread, as with any form of presentation, works best when the project is well planned before the images are uploaded. The images themselves can’t be edited in VoiceThread, although there is a doodle function that allows you to add writing to your comments. If the original images or presentation isn’t very good, you probably won’t be able to make it better with VoiceThread. Having said that, VoiceThread is really easy to use – my 5 year old basically has learned how to do it herself. It is easy to share and it is easy to control who views your presentations. Their education accounts (both free and those with a fee) allow teachers to supervise the work their students are creating and sharing. If you are looking for further ideas for using VoiceThread, check out the VoiceThread for Educators Ning or VoiceThread for Education Wiki. This week one of my students was officially dropped from my class roster. I hadn’t seen Rufus (his Latin class name) in a while and other students told me he was planning to drop out. He’s been a student in my class for almost two years, and with only 2 1/2 months left in his high school career Rufus has walked away. The number of adults who’ve attempted to get him into school and to support him is probably too high to count. There have been calls home and meetings and interventions and disciplinary actions and accommodations made. But in the end, he has walked away. So who has failed here? Has our public school failed him? Have his individual teachers failed to somehow connect with Rufus? Have the guidance counselors, special education liaisons, administrators, and advisors all failed? Have his classmates somehow failed to help their friend stay on track? If he had more personal relationships with his teachers and adults, would he have stuck around? Have we, in fact, failed Rufus? Legislation like No Child Left Behind or Race to the Top consistently says that it is the schools and teachers that have failed kids like Rufus. “The schools are failing our kids. Teachers are failing our kids.” That’s what the policy makers say. And ratings that measure school success count the percentage of students who don’t graduate and consequently lower the ranking of each district based on that number. The proposed merit pay for teachers won’t come to those of us who work so hard and so long only to have a student walk away. Policy makers don’t seem to recognize the influences that pull kids out of school: drugs, family crises, financial distress, etc. They only focus on pointing to those who are working so hard for kids to get a student this close to graduating, only to fail in the end. I’m sad to have Rufus so quietly deleted from my gradebook this week. I hope to see him at some point, to say goodbye and to wish him good luck in the future. In the end I do not believe that our school that has failed. I didn’t fail Rufus. We didn’t leave him behind. One day, he just decided to walk away.